Baltasar Garzón, Trailblazing Judge Who Pursued War Criminals, Faces Trial of His Own in Spain | Democracy Now! AMY GOODMAN: The great Chilean singer Víctor Jara, who was killed in the days after September 11th, 1973, when Augusto Pinochet, the dictator of Chile for 17 years, rose to power. Víctor Jara along with thousands of others were murdered by the Pinochet regime. This is Democracy Now!, democracynow.org, The War and Peace Report. I’m Amy Goodman, with Nermeen Shaikh. NERMEEN SHAIKH: We turn now to the court case of Spanish Judge Baltasar Garzón, who is known for ordering the arrest of Chilean dictator Augusto Pinochet and seeking to indict members of the Bush administration for their role in torturing prisoners. Now Garzón himself is facing trial in Madrid, after right-wing groups objected to his investigation of atrocities committed by supporters of the dictator Francisco Franco. The human rights crimes came during Franco’s reign from 1936 to 1975. More than 100,000 opponents of the regime were executed or disappeared. While prosecutors reportedly disagreed with the charges that Garzón had exceeded his authority, Spanish law allows civilians to lodge criminal charges. Yesterday, Judge Garzón testified in his own defense at Spain’s Supreme Court. JUDGE BALTASAR GARZÓN: [translated] I am not going to respond to any of the questions from the prosecution, as I consider that they are not legitimate to be in this room acting as prosecutors. NERMEEN SHAIKH: If convicted, Garzón could lose his right to sit as a judge in Spain. AMY GOODMAN: Judge Garzón has used the doctrine of universal jurisdiction to investigate war crimes and torture across national lines, famously indicting Osama bin Laden and other members of al-Qaeda in 2003 and attempting to indict members of the Bush administration for authorizing torture at Guantánamo and overseas. In 1998, he ordered the arrest of Chilean dictator Augusto Pinochet, leading to Pinochet’s arrest. Garzón’s supporters were disappointed after the court failed to throw out the case yesterday in Madrid. IAN GIBSON: I mean, this country has not resolved the problem of the Spanish Civil War, because there are 130,000 people out there still lying in common graves, and the state should be searching for them, to give them a decent burial. And it’s not doing it. It’s not doing it, because the right wing in this country doesn’t want to do it, doesn’t want to forgive. And it’s terrible. AMY GOODMAN: We turn now to Reed Brody, counsel and spokesperson for Human Rights Watch. He has been in the courtroom observing Garzón’s trial. Reed, welcome to Democracy Now! 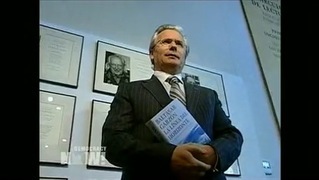 Tell us exactly who Baltasar Garzón is and how it is that he’s on trial himself. REED BRODY: Well, as you say, he’s probably Spain’s most—in fact, one of the best-known judges in the world. And the indictment that he launched against General Pinochet in 1998, leading to his arrest in London, created what’s become known as the Garzón effect, a kind of a justice cascade. And it really empowered victims all over the world to challenge the transitional arrangements that had left the perpetrators of the worst atrocities in power. And so, thanks to Garzón, not only in Chile, but in countries like Argentina, Uruguay—this week a general is on trial in Guatemala—in Africa, you see victims taking up his principles. And in that struggle, court after court has said that the obligation of a country to investigate the worst atrocities cannot be extinguished by an amnesty law or by the passage of time. And in Spain, of course, as you mentioned, Spain is a country that is littered with mass graves from the Franco era. And over the last several years, a movement has grown up of the children and the grandchildren of victims asking what happened to those people. And they filed complaints in Spanish courts. And so—and Garzón took up those complaints. And the irony here, of course, is that he is being prosecuted in Spain for trying to apply the very principles that he so successfully promoted internationally. And so, his investigation was not only overturned on appeal, which would be bad enough, but as you mentioned, these right-wing groups then actually charged that he had committed a crime by carrying out the investigation. And unfortunately, the judiciary in Spain remains very conservative. Garzón has made enemies on both the right and the left. Most recently, he helped to uncover a massive corruption scandal in the now-ruling Popular Party, but he also, when Felipe González was president of the government, the Socialist, he helped to uncover death squad activity against Basque terrorists. So he has a lot of enemies across the board. And this case, which is only one of three cases, actually, working their way through against Garzón, seems to be a concerted effort by his enemies to cut him down to size. NERMEEN SHAIKH: Reed Brody, Judge Baltasar Garzón spoke to Democracy Now! last year when he was in New York to receive the first Abraham Lincoln Brigade Archives Puffin Award for Human Rights Activism. He talked precisely about the paradox of Spain pursuing a case against him. JUDGE BALTASAR GARZÓN: [translated] This is the paradox and the irony of a situation in which Spain has been a pioneer in the application of universal jurisdiction. Yet, when it actually comes to investigating the case and the facts of the case in Spain, the country denies access to the facts and puts the judge himself on trial. It is the obligation of a judge to investigate the cases and to search for truth, justice and reparation for the victims of these crimes. NERMEEN SHAIKH: Judge Garzón also explained why the crimes of the Franco regime cannot be absolved by an amnesty law. JUDGE BALTASAR GARZÓN: [translated] The paradox again is that the government refuses to investigate the crimes against humanity and at the same time is prosecuting the judge who wants to uncover them. There were between 150,000 and 200,000 people disappeared under the Franco regime, as part of the civil population. It’s still not known where the victims lie buried. It’s a permanent crime, and therefore it cannot be absolved by an amnesty law. NERMEEN SHAIKH: That was Judge Garzón speaking to Democracy Now! last year here in New York. To see the full interview, please go to our website at democracynow.org. Reed Brody, can you talk a little bit about the idea of universal jurisdiction and amnesty law? REED BRODY: Well, universal jurisdiction is the principle that some crimes are so heinous that every state has the right, and often the duty, to prosecute the perpetrators. And that was the principle by which a Spanish judge could investigate crimes committed in Chile or, for that matter, crimes committed against Guantánamo—in Guantánamo. As you mentioned, the only case, or one of the only cases, that is open for the alleged crimes of the Bush administration in its counterterrorism policies is the investigation that Judge Garzón opened in Spain and has been continued by another judge. In fact, two weeks ago, I was called, and I will be going to testify before a Spanish judge based on Human Rights Watch’s reporting on the Bush administration’s counterterrorism policies. Now, the question of amnesty—you know, many countries—and in fact, it goes together with universal jurisdiction, because universal jurisdiction is international law’s answer to the spectacle of tyrants and torturers who cover themselves at home with amnesties. And so, the Pinochet case began—of course, Pinochet was in Chile, he was protected by his own amnesty. He went to England, and Judge Garzón indicted him. But fortunately, by the time General Pinochet went back to Spain, judges in—went back to Chile, judges in Chile found a way around that amnesty, using the same argument that Baltasar Garzón is using in Spain, which is that people who are disappeared, and who remain disappeared until today, those are continuing crimes. So an amnesty that was passed 15, 20, 30 years ago does not bar crimes that continue today. And as long as those relatives are in mass graves, nobody knows what happened to them, they can still be investigated despite an amnesty that was passed a long time ago. AMY GOODMAN: Reed Brody, before we turn to Haiti in the last few minutes of the broadcast, because we want to talk about “Baby Doc” Duvalier, I wanted to ask you quickly about his attempt to bring Bush administration officials to justice around torture. REED BRODY: Well, there were cases—there were four Spanish residents and nationals in Guantánamo, and who are actually being—he was actually prosecuting them for crimes connected to terrorism. But when he learned about what was happening to them, he asserted jurisdiction, and then the Center for Constitutional Rights and the European Center for Constitutional and Human Rights filed cases in Spain. And so, there is an investigation now underway in the Spanish courts looking at the responsibility of U.S. officials related not just to Guantánamo, but to the whole policy of mistreatment of detainees. And that investigation, we know now from WikiLeaks that both the Bush administration but also the Obama administration were putting pressure on Spain, first of all, to get Judge Garzón off that investigation, but also on the state prosecutor to come out against the investigation, as he did. NEXTIs Former Haitian Dictator Jean-Claude “Baby Doc” Duvalier Off the Hook for Human Rights Crimes?